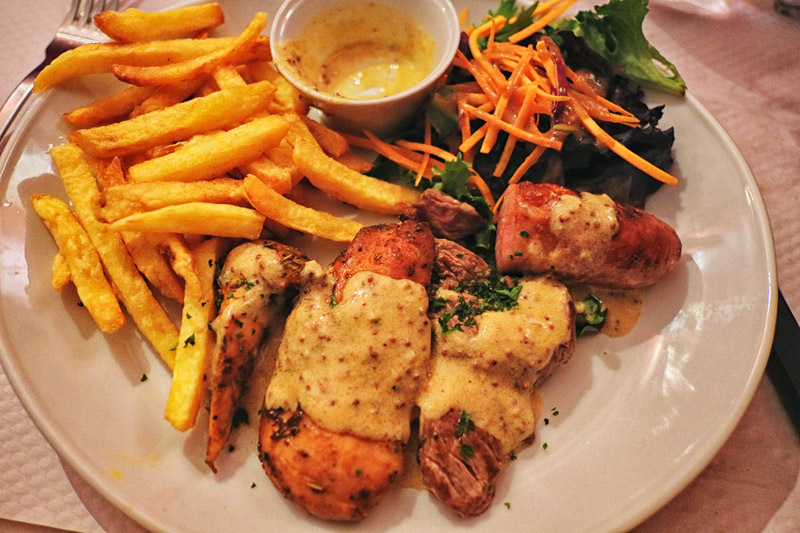 Since our first dining experience at Bistrot Chez France was great, Kent and I both enjoyed the food and the atmosphere (see our previous post here), we then both agreed on returning and ‘definitely try the entrée next time’ as we promised ourselves. 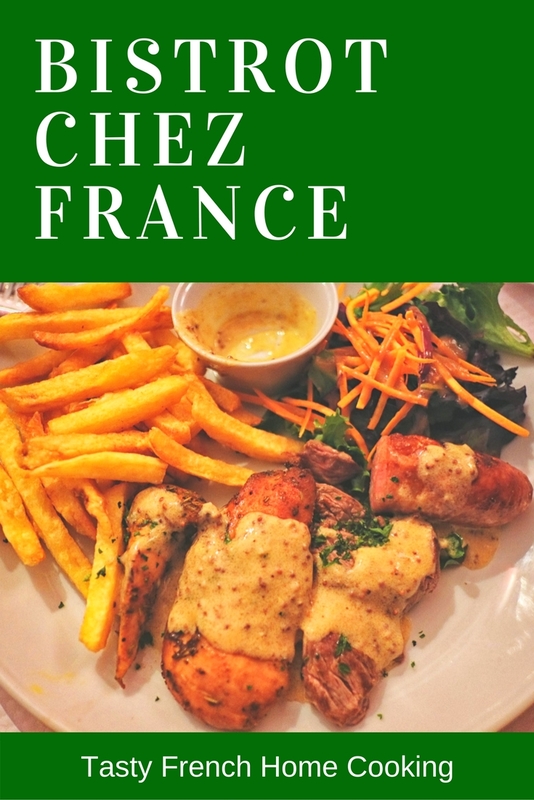 During our last few days in Paris, time seemed to be running out fast; however, we did manage to return to Chez France on our second last night. After all, it was just across the road from our hotel! First of all, how pretty was this white porcelain escargot plate?!! 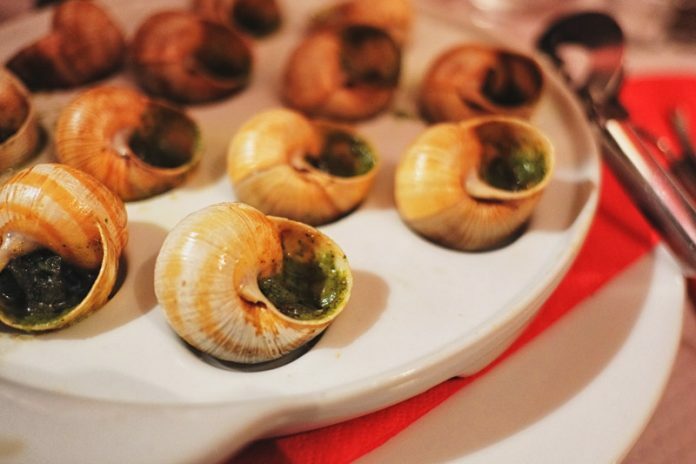 It really made escargots stand out! 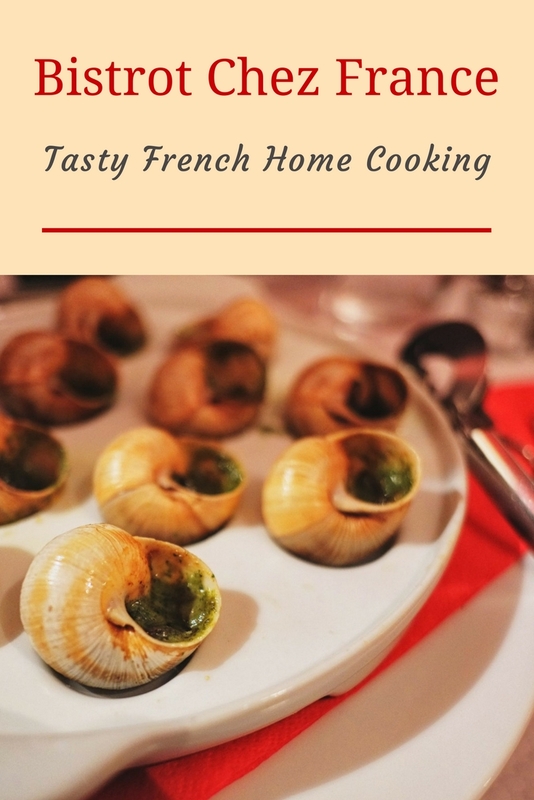 I love having the escargot, mainly because it’s a fun dish to indulge in and even though I’ve been getting better with using the escargot tongs; I still struggle with picking up the slippery escargot shells from time to time. For me, this challenge is the fun bit that comes with the dish! France the owner, kindly brought us a second set of escargot fork and tongs for Kent to ‘give it a go’. Just when Kent thought that he figured it all out and started showing me how to use the tongs properly; sure he had some success, but then one of his attempts ended up in a ‘Pretty Woman situation’ – quelle horreur! 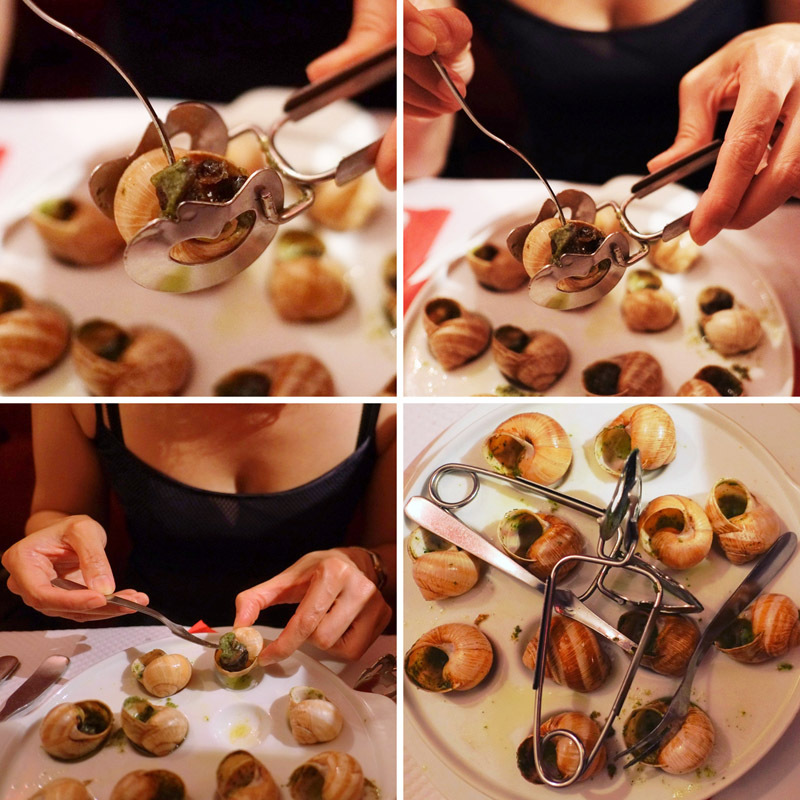 Well, luckily Kent’s flying escargot safely landed on my side plate – Phew!! 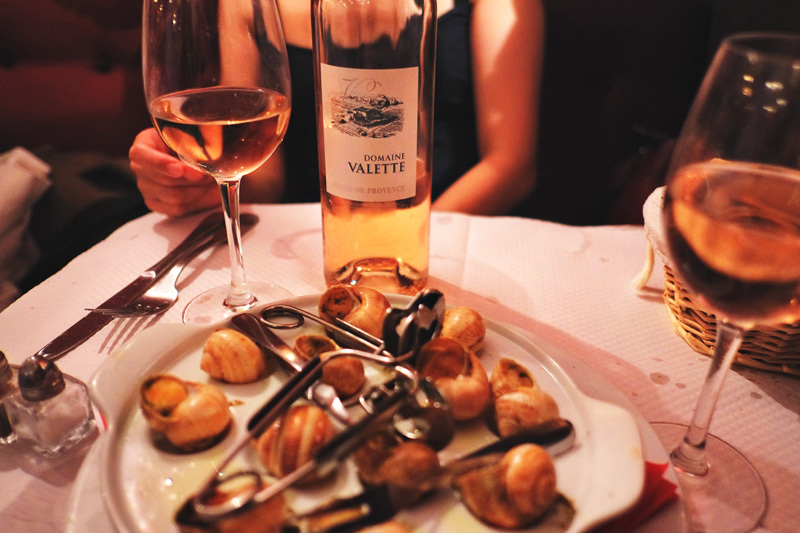 That’s right, the escargots did bring joy and entertainment to our table. 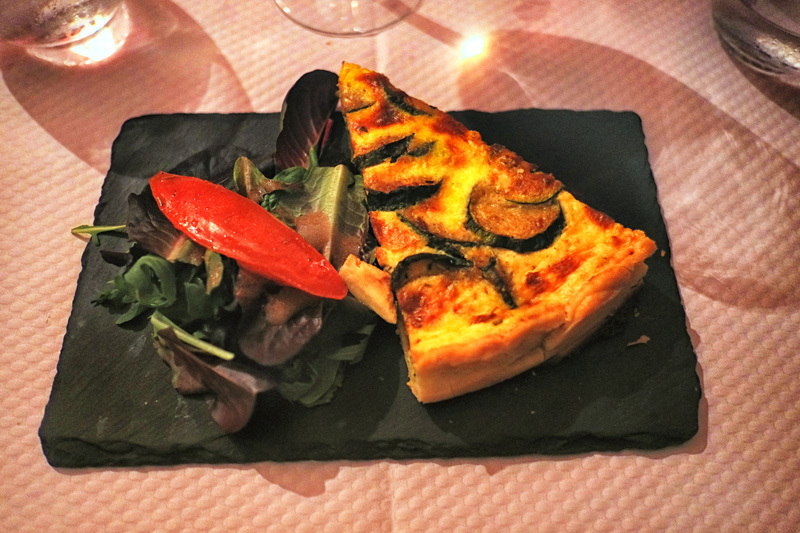 Kent’s quiche look-alike entrée was actually a Zucchini & Ricotta Pie and was that night’s black board special. When I asked how it was, Kent nodded: ‘Tasty!’. Judging from his empty plate, I’d take his word for it. As an accompaniment to the meal ordered the same Rosé as last time simply because we enjoyed it! It’s light, fresh and smooth to drink, a perfect choice for summer dinner of mixed courses. Kent’s generous mixed grill plate included pork sausage, beef cooked to order; chicken and French fries. The beef was medium rare as ordered and ‘very tender’ according to Kent. ‘Good fries at last!’ On top of that, apparently the French fries were the best he had during our month long stay in France. 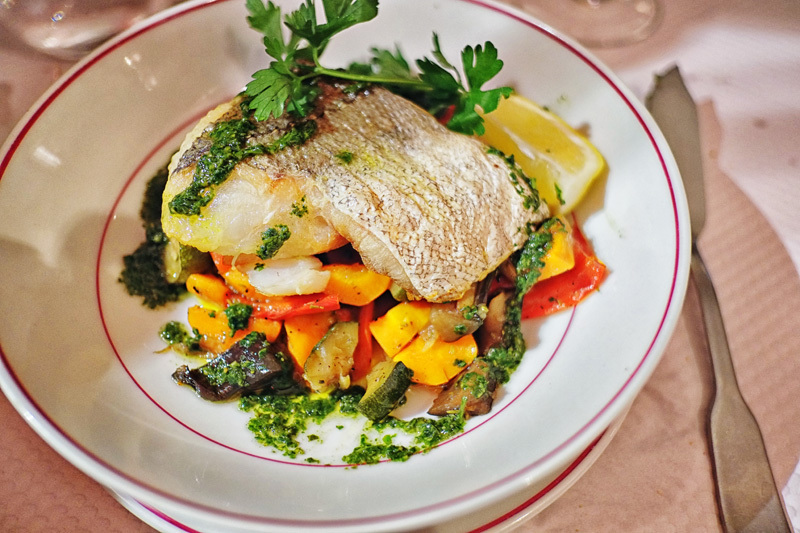 Bistrot Chez France pride themselves on providing traditional French cuisine, fresh produce and home cooked food. When my main course arrived, I was immediately charmed by this pretty yet simple dish of colourful seasonal vegetables topped by my white fish. The amount of vegetables and the fish on my plate made me happy.., after a long day walking around in Paris, I was hungry! The Hake was fresh and this honest meal reminded me a lovely home style dish, just as Chez France is known for. 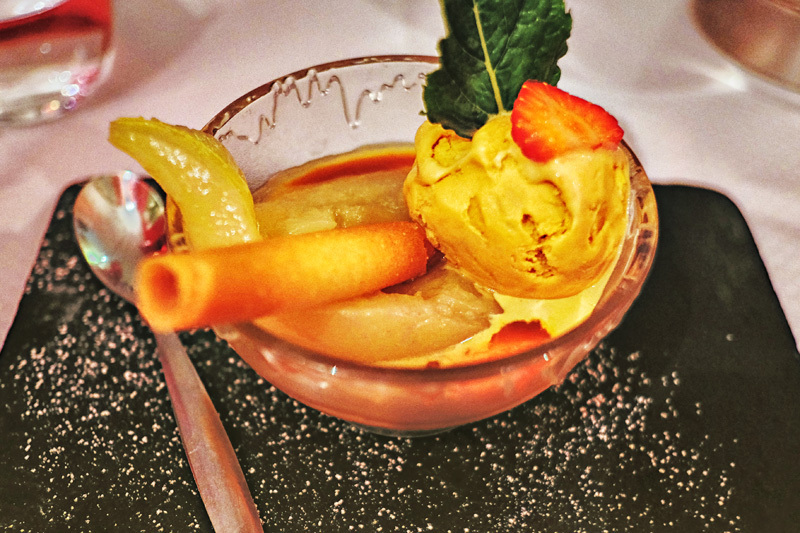 The truth is, I’m not a big fan of ice cream when it comes to the after-meal dessert, but I do love pears so I gave it a go. You know what? I loved it! The bowl was empty pretty soon after this picture was taken. Simply delicious! Somewhere in the past Kent has made a version of Tart Tatin and so was very keen to try the real thing in it’s country of origin. He cheekily congratulated madame France telling her it was better than his own. To which France replied ‘You make this?’ ‘Oui!’ said Kent at which time France gave us a surprised look then scooted away… In amongst all the conversations we had been trying to get madame France to pose for a portrait too, perhaps in the end these two Australians turned out to be a bit too much! 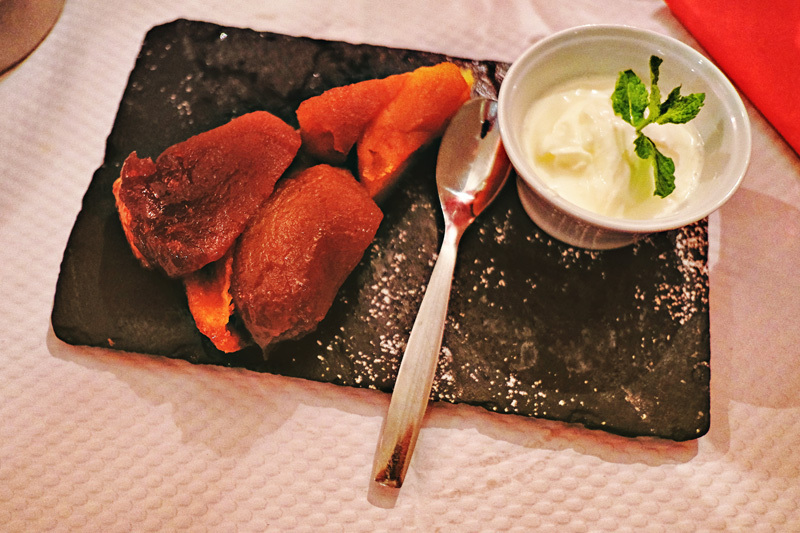 It was hard for us to say goodbye to Paris and we would (and do) miss this Parisian bistro with its cosy ambience, friendly staff and of course the charismatic France herself who is now the former owner of Bistrot Chez France.